Mark Browne joined Grace Episcopal Church in Hastings on Hudson in 2013. He was previously a member of St. Andrews Episcopal Church in Madison, Wisconsin where he lived for twenty-one years. He is a professor of risk management and insurance and chair of the faculty of the School of Risk Management, Insurance and Actuarial Science at St. John’s University. He and his wife, Daria Hrynick, have four adult children: Chelsea, Zachary, Rose, and Beatrice. James DeVita has been a parishioner at Grace Episcopal Church for over 35 years. He has served several terms as a member of the Vestry, and has served as both Junior and Senior Warden in the past. He is an attorney at law, now practicing in his own firm after many years of law firm practice and government service. He and his wife Elsa have five adult daughters (Kate, Sarah, Joanna, Tory and Julia) and seven grandchildren. 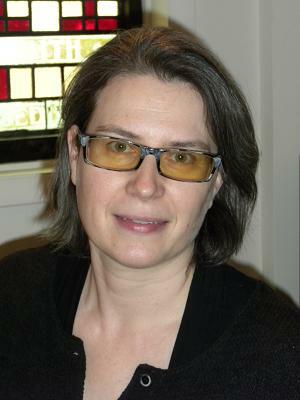 Music Director Jennifer Griesbach studied fortepiano and harpsichord at the University of Toronto with Colin Tilney and harpsichord with Davitt Moroney in Paris. She took up the organ as part of her interest in historical keyboards and was organist and music director at several churches in the San Francisco Bay Area before moving to New York and coming to Grace Church in 2001. Jennifer holds a Ph.D. in musicology from the University of California at Berkeley. Diana Mias is originally from Astoria, Queens. She has a BA in Computer Science from Queens College and worked as a Programmer/Analyst for ten years before “retiring” to start a family. Diana began volunteering in her children’s schools, later becoming a preschool teacher and eventually summer program director. She has been working as Grace's parish administrator for five years. Diana and her husband Ken have three children: Christopher, Katie, and Lauren. The Vestry at Grace Church is composed of the Rector, two Wardens and nine members of the parish. Vestry terms are staggered so one third is elected every year to serve a three-year term. Wardens are also elected for three years: one year as junior Warden, one year as Senior Warden and one year as Vestry member and Stewardship chair. The Rector looks to the Wardens and Vestry members for support and guidance, and parishioners look to them for leadership. Their effort and commitment bring the parish together to further our common goals.